Just like Spider-Man said in Round 9 , “It doesn’t matter how many gods or super-soldiers or Hulks they got on the payroll. Once you’re an Avenger it never fails. … Sooner or later the time comes when it’s your turn to step up to the plate. You just gotta make sure you’re ready.” Hope finally gets her moment to step up to the plate in Avengers vs. X-Men Round 10 . This issue was packed full of action as Hope and the Avengers hit Cyclops with everything they have. The young mutant messiah takes center stage this week as Cyclops comes to the ancient city of K’un-L’un to take her back to Utopia. 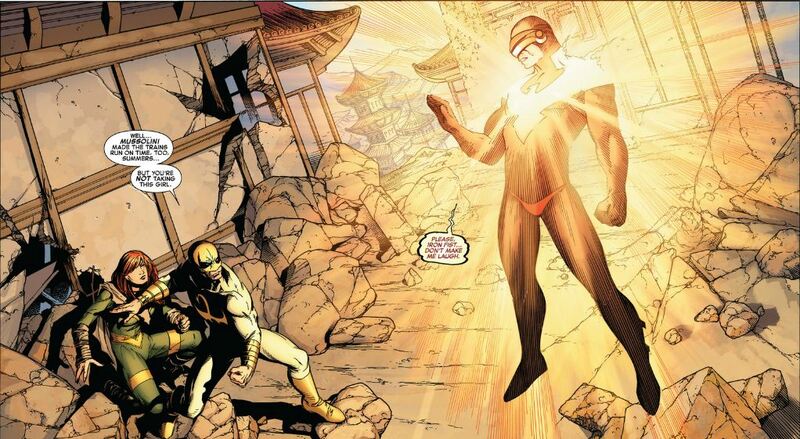 In the beginning, Iron Fist comes to Hope’s defense and tells her to run and find the Thunderer. I can tell that she doesn’t like the idea of running from the fight, but she obeys Iron Fist and runs as fast as her legs could carry her. When she finds Thunderer, it’s as if he already knows what is going on and what needs to be done. Meanwhile, the Avengers are doing everything they can to stop Cyclops from going after Hope. They all take some hard hits before the Thunderer flies in with Hope and the dragon, Shao Lao. History says that Shao Lao had defeated the Phoenix once in the past and the Thunderer is hoping that it could do it again. After the dragon fails to stop Cyclops, he backs Hope into an alley with the Scarlet Witch, Ironman and Beast. As she sees all her friends fighting for their lives (to defend her’s), her anger finally pushes her to do what must be done, and she uses everything she knows (and somethings she didn’t know she had) to defend herself and the Avengers against Cyclops, the head of the Phoenix power. Mean while on Utopia, Emma has fully embraced the dark powers of the Phoenix and has taken control of every mutant on the island. Magneto finally reaches out to Professor X, as he sees that his old friend is possibly the only hope mutant kind has of stopping the power force that they once hoped would bring their people back from extinction. In the end, it’s apparent that with Hope’s powers growing and strengthening, the Avengers have quite the little super-hero on their side. With her help, they may finally be able to over-take the X-Men and end the war between two of the biggest teams in the Marvel Universe. The battle continues in four weeks. You can purchase Avengers vs. X-Men on Comixology, the Marvel Comic Book App or at participating comic book retailers. The graphic novel is already up for pre-orders on Amazon. 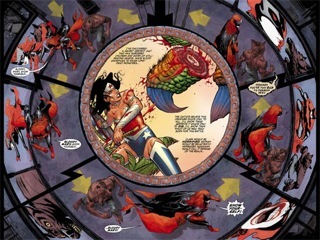 Batwoman #12, art by J.H. Williams III Image: copyright DC Comics. The City of Ember: The Graphic Novel is due out September 25th but I received an advance reviewer’s copy from Random House which was quickly snatched up by my youngest son, age 13. The story is set in a dark, ruined city that has forgotten its past and follows two 12-year-olds as they try to solve the mystery and help the city recover. My son finished the graphic novel in about twenty minutes and pronounced it very good, though he thought the characters looked a bit younger than he expected. The art style is close to Western style animation and is crisp and clear. My son said he liked being able to see some of the things only described in the book come to life. If he had to choose, my son said he’d still go with the book but said the graphic novel would be great for younger readers, as it’s still an “awesome” story. Watch for this one when it comes out. I’ve already mentioned the appearance of a buff-looking James Gordon in Batgirl #12 , but the issue is also worth picking up for the guest appearance of the new Batwoman, the first time Kate Kane and Barbara Gordon have worked together. The artwork makes both ladies look stunning. Batwoman was busy meeting another lady of the DC Universe, Wonder Woman, in Batwoman #12 with art by the insanely talented J.H. Williams, who’s also the co-writer along with W. Haden Blackman for this issue. I thought I’d never see Batman in the Smallville universe, but last week brought him to Superman’s home turf in the newest issue of the digital comic. 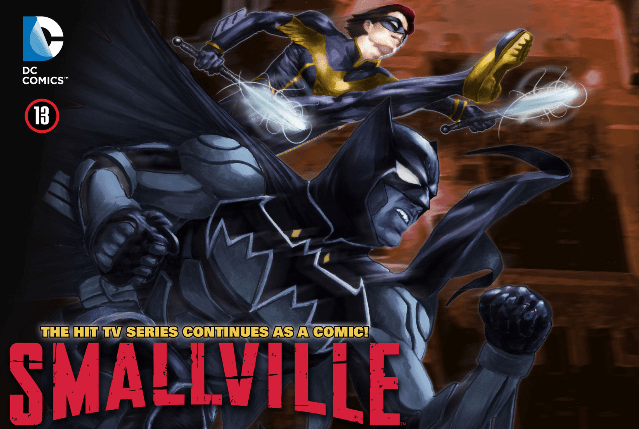 In Smallville: Season 11 #13, Bryan Q. Miller gives us a brash, no-holds-barred Barbara as Nightwing, and a darker, heavily armored Batman. After reading the issue, I can’t wait to see how the pair got their start as crime-fighters in the world of Smallville: Season 11 , and even more excited to see them meet Superman. Next Friday can’t get here fast enough. Gunnerkrigg Court is a webcomic by Thomas Siddell, but I didn’t know that when I picked up the book version in my library. The art on the cover was two cute comic girls, and one holding a grumpy looking stuffed wolf. I’m so glad I picked it up because it’s our new favorite comic series that’s still going! I brought the book home and went to read it but it had disappeared into my son’s room. The next day I asked if he finished it. “Yes! It was great! Where’s the next one?” But I still couldn’t read it because my daughter had taken it into her room. The following day I asked if she was done. “Yeah, I wasn’t sure about the main character, but I grew to like her a lot. Where’s the next one?” Both my kids compared Antimony Carver to Lio, in that she is not just unafraid of strange creatures, but welcomes them into her life. 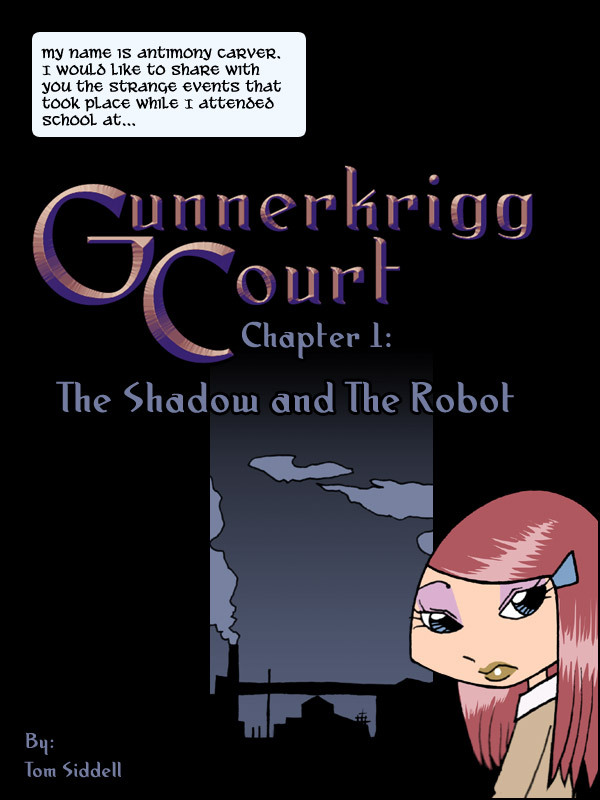 The comic is about her adventures in a very odd “school” called Gunnerkrigg Court. She has an adorable engineering genius girl, a demon trapped in a wolf toy, an optimistic robot, and a shadow as her closest friends. No objectionable content, but the monsters she meets might be a bit much for the very young. 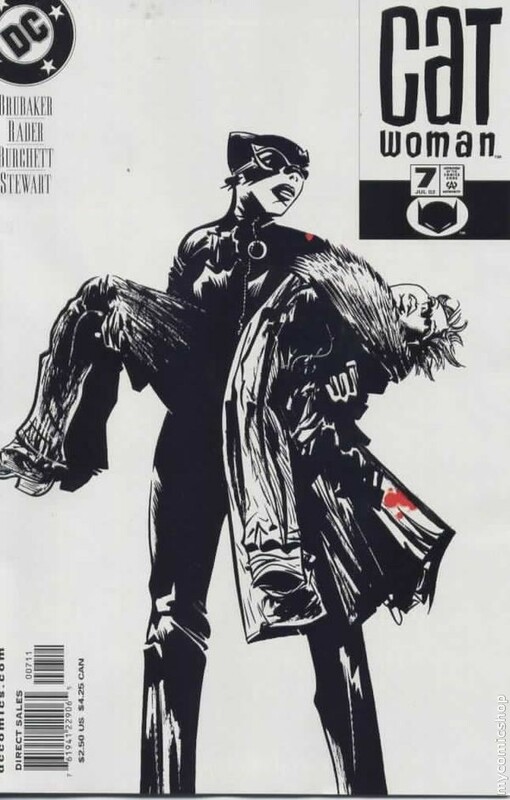 Catwoman (2002-2008) #7 starts to harvest the fruits of the past few issues. This issue is full of interactions to study and savor: Holly and Selina, both of them with Dr. Thompkins, and Catwoman with Slam, as well as various permutations of cops. This issue opens with Holly in trouble and Catwoman making a dramatic entrance to rescue her, and Holly expressing her faith that she was just stalling until Catwoman would show up. Once Holly is safe, Catwoman’s late-night visit to Slam causes him to ponder how long it had been since a beautiful woman poured him coffee in the middle of the night. As Selina and Slam probe deeper into the plot behind the trouble on the streets, we see what a huge octopus it is that they are wrestling. I think the climax for this story arc will be in issue 8!